Glacier Creek Stable is a riding stable operating as a concession in Rocky Mountain National Park, outside of Estes Park, Colorado. The stable is allowed up to 80 horses by the National Park Service. The company, Hi Country Stables, has always mixed mares and geldings in the horse herd there. Many horse operations do not like to mix the sexes because of fighting and injuries that may result. Some owners prefer geldings because they believe them to be more even tempered. The management at Glacier Creek Stable has found, over the last 10 summer seasons, that, although there may be some behavior problems associated with mares, that mares are the majority of their most athletic long distance horses. Because of the athletic ability and durability of the mares, the management would like to eliminate problems associated with mixing the sexes. To this end, they tried an interesting experiment during the summer of 1997. This is strictly an anecdotal experiment on a small band of mares. For advice on your own horses, please contact your local veterinarian. Newer commercial equine preparations may achieve similar results. This article is intended only as a suggestion that extraneous behavior in mares may be suppressed by pharmaceutical means. 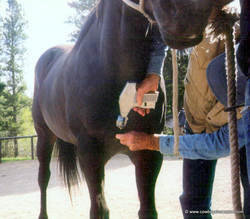 On June 5, 1997, at the beginning of their busy summer season, the Hi Country company veterinarian implanted 24 stable mares with a progesterone implant. He did three more on June 7th and a final two on July 14th for a total of 29 mares. Another company stable had another veterinarian implant about 10 mares the previous summer, and although not as carefully documented, the people in charge of the horses said they would implant all the mares again if the opportunity arose. Another local stable had about 4 of their mares implanted in 1997 and reportedly were happy with the results. Dr. Patrick McCue from Colorado State University conferred with the local veterinarian on optimum dosages. Dr. McCue works with a product called Synovex S which has been used as a growth hormone for beef steers. He tested doses of 8, 32, and 80 implant pellets. All mares still had standing heats. Sixteen pellets, however, is the usual dose and may control some unwanted behavior, but is not heat suppressive. Sixteen pellets of Synovex S releases only 3 mgm. per day of progesterone. 50 to 100 mgm. are needed to suppress heat. Other products available did not seem to do the wanted job well or at a reasonable cost. Regumate was the only sure way to suppress heat. Regumate comes in a syrup form and is given orally on a daily basis. It is also quite expensive for a 21 day cycle. The mare will come into heat immediately when the Regumate treatment is discontinued. It is used by breeding farms to help settle mares for breeding. Progesterone injections are also expensive and are not tolerated well by the mares. The drugs DepoProvera, Norgestamate, and Synchromate B, that are used to synchronize breeding cycles in beef cattle, did not work as desired. The Hi Country veterinarian followed a 3-step procedure for implanting the mares, treating up to five head in a group. 1. The mare was injected intravenously with 1.5cc. of Rompun as a sedative. 2. When the mare exhibited the maximum sleepy state from the sedative, the area of the implant was deadened with injections of Procaine. 3. A special injection gun with an 8 gauge needle was used to insert two doses of eight progesterone pellets subcutaneously in the front of the right pectoral muscle on each animal. The second dose was placed about a half inch away from the first, using the same entrance puncture. The Hi Country veterinarian stated that, although the dosage will not stop the heat cycle in the mares, the aberrant behavior exhibited during heat in many mares should be reduced or eliminated in up to 80% of the animals. He stated the effects should be visible within a few days and should continue for approximately 150 days. The vet made follow-up visits the next day, and the third day to assess any swelling of the brisket. Some swelling was visible in most of the mares, but none were unusual and all were back to normal size within a week. One mare had been seemingly unaffected by the Rompun sedative. She was given a second Rompun injection and still had to be restrained with a leg hobble and twitch. She was sore for about three days from fighting the restraints. Only one other mare required any restraint and she was leg hobbled. She did not fight the hobble. Definite improvement was noticed in at least 10 of the mares. Mares that were "kickers" and not able to be used on trail rides except as guide horses or at the end of a line, were much better behaved and could be used as needed in the line. Five of the treated mares were shipped from the stable before the end of the summer. One was shipped due to chronic colic, but she had been noticeably improved in her behavior. One was shipped for chronically lying down on rides. And three were shipped out for kicking and behavior problems that had not been significantly improved by the implants. The three with behavior problems were new to this horse herd and had not established themselves well in the herd pecking order. The balance of the mares were all well behaved, but may have been that way anyway. Ten of those had been with this horse herd for years and were usually problem free. Five were new to the herd but had no major problems with the other horses. Fewer bites and kicks were observed than in previous seasons. The horse herd seemed much quieter at night and during the day. Attention to mares in heat by the proud-cut geldings was almost non-existent. In the opinion of the Hi Country Stable management at that time, the procedure had been a success and they would not hesitate to repeat it again another time.